It was Pi Day yesterday, and I was lamenting the fact that I did not have any pie. I went to Pie Squared after work, but if your pie is square, does it really count on Pi Day? I don’t think it does. So I poured myself a beer, since clearly my dietary choices are already not working in my favour. And I chose a sweeter beer, because I had no pie. Obviously. Pardon the mess on my kitchen counter, I’ve run out of space in my cupboard so everything is accumulating on the counter. I don’t have much of a sweet tooth, but I have a weakness for salted caramel. It’s mostly the salt – I love salty things. 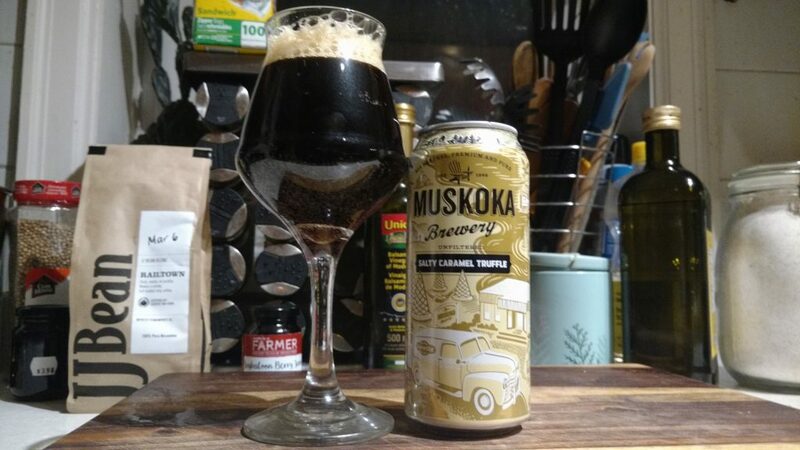 I was lured in by Muskoka Brewery‘s Salty Caramel Truffle, available at the LCBO for $3.50. OK, really I was lured in by the Bonus Airmile offer, cause who hasn’t made a buying decision influenced by extra Airmiles? Did I mention I am having a hard time adulting today? A 473 ml can weighs in at a respectable 5% ABV. The beer is brewed in collaboration with Kawartha Dairy as a tribute to stopping for ice cream on your way to the cottage, and ice cream is one of my favourite things to pair with beer while I’m on vacation. The brewery and the dairy are joining forces to support ongoing local community improvement projects, so really I’m drinking for a good cause here today. In lieu of having a St. Patrick’s Day post this year, I’m going to sit here and drink a salty beer, since I have a salty personality. We tend to avoid making St. Patrick’s Day recommendations since we don’t really encourage binge drinking, so I suppose pick your favourite libation review from the site and have a few sips. Just don’t over do it. This brew didn’t impress me as much as other Muskoka brews have. I quite like this Bracebridge, ON brewery as a rule of thumb. It’s one of the first breweries we ever visited with our dog, and a great place to stop if you’re headed up to Algonquin Park. But I prefer their true to style beers, and this bock didn’t hit all the high notes for me. It did, however, remind me that I had cheesecake in the fridge in a pie plate, so I guess I am eating pie after all. Suckers. I’ve got homemade cheesecake and you don’t. Appearance: Deep, dark colour. Unfiltered. Rapidly fading tan head. Aroma: Hint of milk chocolate, like finding leftover cocoa powder in your cupboard. Makes sense since there is cocoa powder in the brew. Malt. Werther’s Original candies that you found at the bottom of your purse. Fine. I need to clean my kitchen and my purse, OK? But I had pie for dinner so I’m not about to clean tonight. Taste: Milk chocolate on the palate, mild bitterness from the cocoa powder and the hops. Aftertaste: Wham. Salty and umami on the finish, and a saltiness that lingers as if you ate salty food. My blood pressure is not going to be a good reading after this one. Food pairing: Pie. Actually I ate it with my plain cheesecake that I baked with real vanilla, and it went nicely. My cheesecake had reduced sugar, and a pinch of salt to really round it out. It worked surprisingly well together – better than having the beer on it’s own. Overall: Not bad, but not for me. Flavoured beers aren’t my thing.